The military is known around the world for making individuals become stronger people. They are the epitome of dedicated, loyal and hardworking. But, military values are not just influencing the individuals that work within the military. On the contrary, family life can be affected by these inherent values too. The core values of the military can have a positive impact on your family bonds and can truly strengthen your family. Respect is a huge part of the core ethos of the military. As such, this is entrenched in your family life. Remaining cool, calm and collected is all part of the job when you are in the military. But, this also transpires into your family too. Remaining calm and collected, whatever situation arises, is part of your family unit. Ultimately, it makes your family a stronger one. After all, if you are not losing your cool at every little bump in the road, your family becomes a better unit all round. You learn how to handle issues in a more appropriate way and as such, you learn the art of teamwork and how to conquer these problems as a team. During times of deployment, your family has to get used to you being away. But, one of the best things about your return is that the family makes time to spend quality time together. As such, you end up spending more quality time together when you are home, and you make the time for more fun pursuits. Not many families can claim that they do this! As many military families have to make the most of the time that is spent apart, they are all too aware of how precious family time and togetherness is. A military family is all too aware of the changes of their family dynamic. For many, they have to come to terms with emotional adjustments. But, with this, they become conscious of the importance of supporting each other. Many military families are often more supportive and communicative than civilian families. This is because they are more aware of the emotional impact of having a family member away from home for extended periods of time. 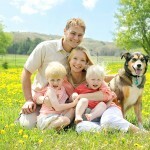 While separation can be tough, you end up with a family unit that is more ‘together’ than apart. They are aware of the anxiety that having a family member not present can bring. As such, they end up being more supportive of their peers and end up being more well-rounded and balanced, emotionally, than their peers. Loyalty is a massive part of the military. After all, you are loyal to your buddies and your country. As such, this ensures that the members of your family are loyal too. By espousing these values of loyalty, your family is more trusting. Loyalty is essential to any family unit, from spouses to children. Ultimately, your family becomes better and more dependable by having these positive attributes as part of their everyday life.